Yesterday we had another view down the south side of the acropolis in Athens, Greece. Now we move to the north side, down below the acropolis, to the Roman Forum. 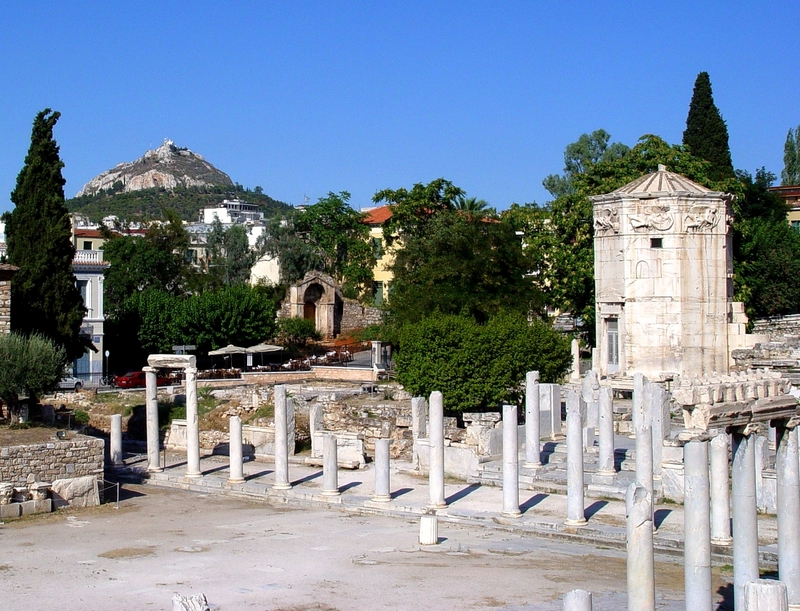 In our photo here you can see a portion of the forum, the Tower of the Winds (right), and to your distant left Mount Lykavittos. Roman Forum, Tower, and Mt. Lykavittos in Athens, Greece. Photo by Leon Mauldin. The Tower of the Winds stands in the Pláka below the north side of the Acropolis. In the planning of the modern city of Athens in the 19th century. Eólou Street, named after the wind god Ailos, was aligned directly on the tower, which forms a landmark at its southern end. Built about 40 B.C., the tower is an octagonal structure 12m/40ft high, with sundials on the external walls; it originally housed a water-clock. Around the top runs a frieze with reliefs representing the eight wind gods – the beardless Notos, pouring out rain from an urn (south); Lips, holding the stern ornament of a ship (southwest); Zephyros, a youth scattering flowers (west); Sykron the bringer of snow (northwest); the bearded Boreas, blowing into a shell (north); Kaikias, also bearded, the bringer of hail (northeast); Apeliotes, a young man bearing ears of corn and fruit (east); and Euros, wrapped in a cloak (southeast). To the south of the tower is a building of the Roman period (first century A.D.) with the springing points of arches. Its function is uncertain (office of the market police, Caesareum?). Adjoining the entrance to the excavated area is a marble latrine with seating for nearly 70. The water-clock is located outside the western entrance to the Roman Market. It served as a form of meteorological station by combining a sundial, a waterclock and a weathervane showing the direction of the wind. The clock is commonly known as “Aerides” (the winds) (Planetware.com). once well outside Athens but now surrounded by the city on all sides, is the dominant hill in the plain of Attica. It is a hill of cretaceous chalk, covered with various species of plant life, and is a popular place to go to escape from the hurly-burly of city life. At the top stands the chapel dedicated to St George, from where there are extensive views of the whole city (Planetware.com). Click photo for larger view. Use search box at upper right for more posts on Athens, as well as other biblical sites. This entry was posted on Tuesday, February 10th, 2015 at 3:34 PM and is filed under Athens, Bible History and Geography, Greece, New Testament, Old Testament, photography, Travel. You can follow any responses to this entry through the RSS 2.0 feed. You can leave a response, or trackback from your own site.